Submissive urination can be annoying and frustrating. It can also take a while to break your dog of this behavior. Whatever you do, try to remain calm and don’t punish your dog. Build confidence – basic obedience training can build your dog’s confidence. Get your dog used to noises, people, and places slowly. A walk through the park on a weekend, downtown, or anywhere where there’s people and noises can help get over the fear of loud noises. Do it in small trips and start out going on less crowded times like after rush hour or a weekend afternoon. 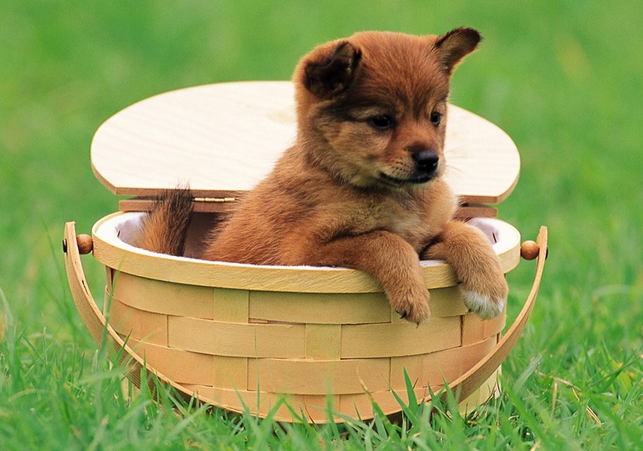 Use a crate – crate training reinforces your dog to hold it until outside. Put the crate near the door to allow for a quick exit to the backyard or out the front door. Crating also gives your dog a safe space to stay when you can’t supervise or aren’t home. Stick to a schedule – take your dog out on a regular schedule. This includes getting up early on weekends too, no sleeping in. A schedule will help prevent buildup on your dog’s bladder and cut down on accidents as you two head outside. Praise your dog for going outside – as you two are outside, walk around quietly, and when your dog finally goes, praise him. Try to minimize the excitement, do it calmly. Quietly clean up the mess – your dog is still going to have accidents in the house. A truck going by or loud noise could startle your dog and he may pee. Maybe you’re arguing on the phone and your voice will scare him. If this happens don’t say anything to your dog. Take him outside an clean up the mess without your dog watching you. Practice – this will take time. It will test your patience. You’ll go through lots of paper towels and cleaning spray. Go for walks with your dog and make sure you two have fun times for your sanity and his confidence.